When young botanist Alfred Homer is invited by his parents’ friend, Professor Morgan Bruno, to accompany him on a trip through Canada, he’s unaware he’s about to go on a journey of self-discovery. Bruno, an admirer of the poet John Skennen, wants to travel through that part of the country where Skennen lived, and see the places inspiring him to write his most famous poetry as well as speak to the people who knew him. Ignorant of either Skennen or his work, Alfred has several reasons for accepting Bruno’s invitation: It’s the anniversary of his parents’ deaths, his wife has just abandoned him, and Bruno plans to visit Feversham, a town where Alfred has heard a rare plant with amazing healing properly grows. His contribution to this adventure will be to carry the professor’s luggage and transcribe his notes. In return, Bruno will pay his meals and fare. Their journey will be an experience neither man will forget, an innocent blundering through a Canada that is like nothing either has before seen. They will visit various towns frequented by Skennen: Coulson’s Hill, where the Indigenous Parade is held, allowing the native population to pay back their invaders. The town of Nobleton where Pioneer Days are celebrated by seeing who can build a house the fastest, then burn it down, so next year another contest can be held to see who can build a new one faster. The town where Skennen met Carson Michaels, a woman who would only love a man who knew what made her cry. And then there’s the beautiful Clare. “That would be unfortunate,” she said. They will visit John Skennen’s relatives, a group as bizarre as any of Lewis Carroll’s characters. “It seemed she wanted to hear Professor Bruno talk about her nephew, but then she pulled out an umbrella and hit him with it. They will learn that Skennen wasn’t always his name and discover the fate of the man who once was John Skennen. And they will come away enlightened, especially Alfred, who finds unknown powers within himself, and a deeper appreciation for the life to which he returns. 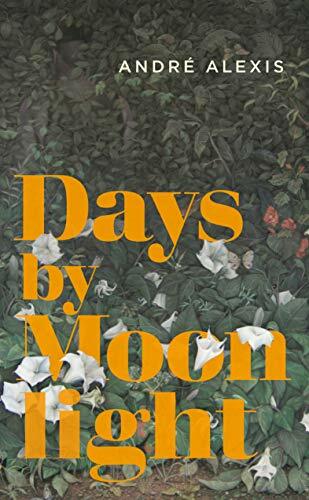 Days by Moonlight is a trip down the rabbit hole to a Wonderland for adults, where the real and the unreal walk hand in hand, and it’s difficult to separate the two. Like that story, it makes sense while being read. It’s only afterward as the reader tries to explain it to others that difficulties arise. With characters as peculiar and unconventional as they are likable, and events seemingly sane while they happen, but only afterward are realized bizarre, the entire story has the quality of a complicated but harmless dream. Adding to add to that ethereal quality are Alfred’s drawing of the plants and herbs he sees along the way, including the rare plant called “five fingers,” one of the reasons he goes on the journey.